and given McG’s blog review, cite one specific argument of Doherty that Casey has dealt with “directly and in detail” and “more effectively” than found anywhere else. Casey not only challenges some bizarre misreadings of critical scholarship he also brings his expertise and experience to analyses of a range of ancient sources. What is distinctively new about this book, and of significance for future research on strands within the phenomenon of “mythicism” is his examination of Christian “fundamentalist” backgrounds of certain conspiracy theorists who retain all the hallmarks of “fundamentalism” by a staunch refusal to listen to positions with which they do not agree and which they relentlessly misrepresent. a verifiable bizarre misreading of critical scholarship by a serious mythicist (Doherty, Price, Carrier. . . ) — or even by those who bypass the mythicist arguments altogether in their own writings, such as Tim or me. to cite an example of verifiable “hallmarks of fundamentalism” and “refusal to listen to positions with which they disagree” and “misrepresentation” among any of the writings of serious mythicists — or even by those who bypass the mythicist arguments altogether in their own writings, such as Tim or me. I’m serious. I once posed a similar challenge to Casey himself. He declined, of course. It’s a pity because there is nothing I would love more than to seriously and honestly critically discuss views of some of the mythicists, and my own views, too — though my own views are on a different tangent generally and are not mythicist arguments at all. If any readers can persuade any of these gentlemen and scholars to take up my invitations I would be most interested to read what they had to say. Two of the writers [Casey] most extensively tackles with furor are Neil Godfrey and Tim Widfowfield, who both write at Vridar. They happen to be some of the most astute and well-read amateurs you can read on the internet on the subject of biblical historicity. I call them amateurs only for the reason that they don’t have, so far as I know, advanced degrees in the subject. But I have often been impressed with their grasp of logic and analysis of scholarship. I don’t always agree with them, but I respect their work. Casey loathes them. And attacks them as mythicists throughout the book, of course lumping them in with all other mythicists. Again I draw attention to the asterisked sections. Carrier has particularly high praise for Tim Widowfield’s recent critiques of Casey’s attempt to argue for Paul’s silences on the basis of a certain sociological theory. He also recommends readers to have a look at Tim’s post on Casey’s argument from Aramaic sources and his appendix on Latinisms. Tim Widowfield has already produced an astutely devastating take-down of Casey’s arguing from Aramaic (Casey’s Hammer: How Monomania Distorts Scholarship). His summary is spot on: “Maurice [Casey] is a first-rate Aramaic linguist, but as we’re finding out, a rather mediocre [New Testament] scholar and sub-par historian.” I highly recommend you read that, as Widowfield shows not only the logical failures, but also how Casey ignores or distorts leading scholarship counting against him, and how that renders him argumentatively untrustworthy: if he so badly distorts the facts in the case Widowfield exposes, how can we trust Casey isn’t distorting the facts as badly in every other case? Widowfield has even more extensively documented Casey’s shadiness and dishonesty in trying to rescue his Aramaic theory from competing explanations, making the quite apt point that Casey has consistently behaved very unprofessionally in pursuit of this. Widowfield’s critique in this case is of Casey’s Appendix to Jesus on Latinisms in Mark: as Widowfield concludes, it “is a model for how not to write, how not to argue, how not to deal with the public, and how not to do scholarship.” He then backs up every charge. And that after summarizing a general point that experts in the community need to stop letting their peers behave this way without comment. Because it is discrediting the entire field. . . .
Long time readers of Vridar might recall a couple of years ago Stephanie Fisher commenting here in hostile attacks on what she perceived as certain mythicist arguments. At the time Steph made it clear that she was Casey’s conduit for information about mythicists and mythicism. Steph very often simply failed to grasp the views that she thought she was opposing. Nor could she generally bring herself to defend her own view. Casey’s book is in large part the result. Many readers will not believe that scholars and gentlemen can possibly be so unprofessional, ignorant and dishonest in their treatment of views they presumably find disturbing and will complain about Carrier’s blunt spade-naming language when identifying the unprofessionalism of Casey’s work in this volume. Casey’s work at certainly many instances is culpably ignorant at best and blatantly dishonest at worst. People like Jim West and James McGrath won’t care about that. That’ll all be part of the entertainment value they find in the book. To anyone who thinks Carrier is overstating his criticisms I ask you read the book and see for yourself. And do follow up the sources Casey cites, and compare. Casey has a little bit to say about yours truly, too. I will let the honest inquirer compare what Casey says about me (and Tim) with what we have written here and decide for him or herself the appropriateness of Carrier’s review. Who are Casey’s targets and why? Neither Tim Widowfield nor myself are mythicists. Tim is an agnostic on the question. I am not interested in arguing a case for mythicism–I have always argued pretty much along the same lines as Thomas L. Thompson—that is, the question is irrelevant for understanding the origins of the gospels and the Jesus of the gospels. That question is primarily literary and theological and any role a historical figure may have played is probably irrelevant given the state of the evidence. I am more interested in exploring the origins and nature of the gospels and Bible–the [historicity of Jesus] question is irrelevant as far as I can see from the evidence we have available to work with. Posted on 2014-03-04 11:00:20 GMT+0000 by Neil Godfrey. This entry was posted in Uncategorized and tagged Casey: Jesus, Maurice Casey, Richard Carrier. Bookmark the permalink. Even McGrath must blanch when he sees Casey trash the idea that the Pauline letters are the earliest Christian documents. McGrath doesn’t blanch at what he sees in Casey’s book. I remember when I read an early draft of Casey’s book, I too found some claims problematic and even self-defeating. No, McGrath still praises the book, even though it is obviously written by somebody in very poor health. I can’t wait for someone to write a real scholarly book on the historicity of Jesus from a non-mythicist point of view! So far the reviews of Casey’s and Ehrman’s attempts have been so bad I’m not going to spend any time or effort reading through those books. I want someone to address the points of mythicists, not to attack them. Unfortunately the closest thing we’ll get soon is (probably) a work by a historical Jesus agnostic summing up both sides, or even a survey by a mythicist of the opposition’s position. Such a pity. If Casey’s book is a tenth as bad as it sounds from Carrier’s review, T&T Clark should do the honourable thing and retract it, as Thomas Nelson did with Barton’s “The Jefferson Lies”. That kind of pseudoscholarship and petty posturing besmirches the good reputation T&T Clark has worked hard to establish. Congratulations Neil and Tim, your reputations as ‘astute and well-read’ have been enhanced by Casey by direct contrast. Off to open a decent Rioja and continue reading. If bloggers and blogs are such ephemera, why does Casey spend so much time on them? According to Hoffman, this was the book that was going to demolish mythicism once and for all. I guess we’ll have to await a third attempt. 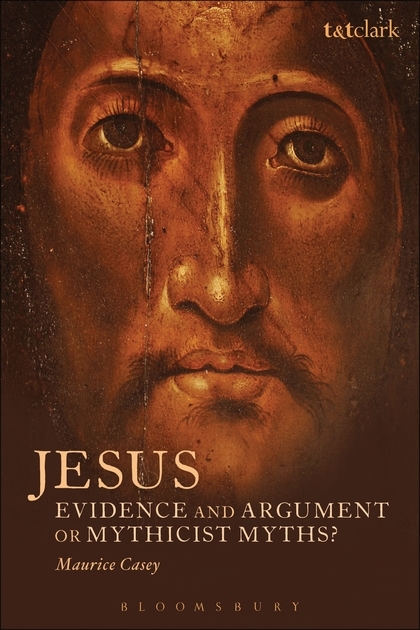 Maurice Casey’s book “Jesus: Evidence and Argument or Mythicist Myths?” is the worst book I’ve ever seen on this subject. This book utterly ruins the crediblity not only of Maurice Casey, but also, the publisher, Bloomsbury T&T Clark, for publishing such crap. The book should be pulped and retracted by the publisher. It really is that bad. Casey misrepresents the mythicist arguments and is consistently dishonest. This book is a true waste of paper/trees. Jesus would never approve of such a dishonest and libelous book. Like Lukeburrageluke Burrage and some other commenters, I am not going to waste money on this senseless murder of trees. If this is how the Historicists fight Mythicists, eventually the Mythicists will win, hands down; and honest, objective NT scholarship will conclude that the clothes (NTJ) have no emperor (HJ)!